Bhakta Mark – NY US: There are those who claim that if we continue to follow the Founder Acarya’s order and initiate new disciples on his behalf after his disappearance, there will be a break in the Parampara (disciplic succession) because a person needs a physically present Diksa (Initiating) Guru in order for the Parampara to continue. 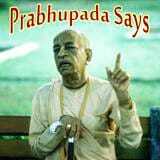 Srila Prabhupada’s direct teachings show us otherwise. 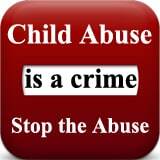 Explicitly. First note the names found commonly on the official list of our disciplic succession. Next, note the amount of rarified, advanced, pure devotees who also faithfully perpetuated the disciplic succession. Ananta Acarya was a reservoir of all good qualities. No one can estimate how great he was. Pandita Haridasa was his beloved disciple. Sri Ananta Acarya is one of the eternal associates of Sri Caitanya Mahaprabhu. … In Jagannatha Puri, or Purusottama-ksetra, there is a monastery known as Ganga-mata Matha that was established by Ananta Acarya. In the disciplic succession of the Ganga-mata Matha, he is known as Vinoda-manjari. One of his disciples was Haridasa Pandita Gosvami, who is also known as Sri Raghu Gopala and as Sri Rasa-manjari. His disciple Laksmipriya was the maternal aunt of Ganga-mata, a princess who was the daughter of the King of Puliya. Ganga-mata brought a Deity of the name Sri Rasika-raya from Krsna Misra of Jaipur and installed Him in the house of Sarvabhauma in Jagannatha Puri. The disciple in the fifth generation after Sri Ananta Acarya was Sri Vanamali; in the sixth generation, Sri Bhagavan dasa, who was a Bengali; in the seventh generation, Madhusudana dasa, who was an Oriya; in the eighth generation, Nilambara dasa; in the ninth generation, Sri Narottama dasa; in the tenth generation, Pitambara dasa; and in the eleventh generation, Sri Madhava dasa. The disciple in the twelfth generation is presently in charge of the Ganga-mata monastery. Bhagavata Acarya, Visnudasa Acarya, Cakrapati Acarya and Ananta Acarya were the sixth, seventh, eighth and ninth branches of Advaita Acarya. In his Anubhasya Sri Bhaktisiddhanta Sarasvati Gosvami Prabhupada says that Bhagavata Acarya was formerly among the followers of Advaita Acarya but was later counted among the followers of Gadadhara Pandita. The sixth verse of Sakha-niryayamrta, a book written by Yadunandana dasa, states that Bhagavata Acarya compiled a famous book of the name Prema-tarangini. According to the Gaura-ganoddesa-dipika, verse 195, Bhagavata Acarya formerly lived in Vrndavana as Sveta-manjari. Visnudasa Acarya was present during the Khetari-mahotsava. He went there with Acyutananda, as stated in the Bhakti-ratnakara, Tenth Taranga. Ananta Acarya was one of the eight principal gopis. His former name was Sudevi. Although he was among Advaita Acarya’s followers, he later became an important devotee of Gadadhara Gosvami. Reading the above quotes we find that some very influential acaryas are not mentioned in the common, official list of the disciplic succession of the Brahma Sampradaya, which we belong to. There are full branches off some of the main trunks, and even important trunks that are not listed. Why? The Prominent Acarya whose name gets mentioned in the list is one who had to make adjustments due to a break in the disciplic succcession. He had to give teachings according to time place and circumstance that would point back to the Essence of the giver of the seed of Bhakti, Lord Caitanya. 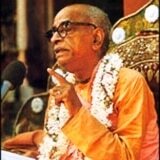 There are many trunks, branches and sub-branches of disciples of disciples, but only the name of the PROMINENT ACARYA who starts a NEW main trunk is listed in our list of disciplic succession, and he is the important one to pick up from, Srila Prabhupada confirms this word for word in this next quote. “Regarding your question about the disciplic succession coming down from Arjuna, it is just like I have got my disciples, so in the future these many disciples may have many branches of disciplic succession. So in one line of disciples we may not see another name coming from a different line. But this does not mean that person whose name does not appear was not in the disciplic succession. 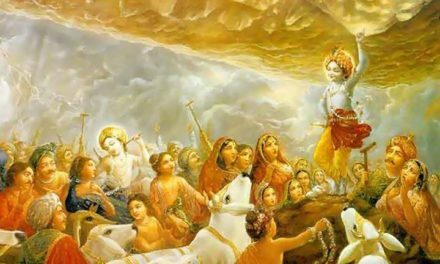 Narada was the Spiritual Master of Vyasadeva, and Arjuna was Vyasadeva’s disciple, NOT AS INITIATED DISCIPLE but there was some blood relation between them. SO THERE IS CONNECTION IN THIS WAY and it is not possible to list all such relationships in the short description given in Bhagavad-gita As It Is. So there are MANY ways to come under the disciplic succession, but the ONE COMMON POINT is that an authorized Acarya starts the particular trunk or branch. He is the prominent acarya who’s orders must be followed if a disciple is to continue the branch. If that disciple instructs differently than his acarya, the branch dries up. Sri Advaita Acarya approached Lord Caitanya who was the most prominent acarya despite the fact that HIS initiating spiritual master was Madhavendra puri. It is a fact that Madhavendra Puri is listed PREVIOUS to Lord Caitanya on the Parampara list of prominent acaryas. Advaita acarya picked up from the Prominent Acarya, who was the current link who introduced something NEW to be followed by everyone, superseding the orders of the acaryas previous to him. He strictly followed the teachings of that prominent acarya. The current link is the disciple who is following the Prominent Acarya’s orders, cent per cent. As the previous letter to Kirtananda (1/25/69) showed, such a link might “only” be an instructing spiritual master! He does not need to be an initiating spiritual master. It is right there in black and white. Currently”, the only acaryas I recognize are those who follow the instructions of the Founder-acarya of our trunk of the devotional tree. He told us to become instructor gurus, but he would remain the initiating Guru. In the Iskcon trunk of Sri Caitanya Mahaprabhu’s Tree of Bhakti, there is one “Founder-acarya” and initiating spiritual master, who authorized all his disciples to represent him as priests for initiations, and to act as Siksa Gurus or Acaryas. He also said that only strictly obedient disciples can come to that platform of Siksa Guru. Simple logic dictates that among those posing as Diksa Gurus within Iskcon, there is not ONE who meets this criteria of obedience. Thus, sad to say, they themselves have produced dried up branches that cannot perpetuate the bonafide disciplic succession. All glories to the Prominent Link Srila Prabhupada and his current links who follow his ritvik system!